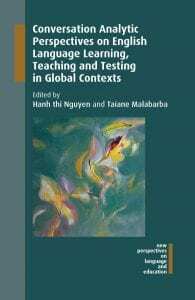 The edited volume Conversation Analytic Perspectives on English Language Learning, Teaching and Testing in Global Contexts is out! With Peter Sayer and Taiane Malabarba, I have a chapter in it, ‘Teaching English in marginalized contexts: Constructing relevance in an EFL classroom in Rural Southern Mexico’. Check out the publisher’s blog post about the volume. 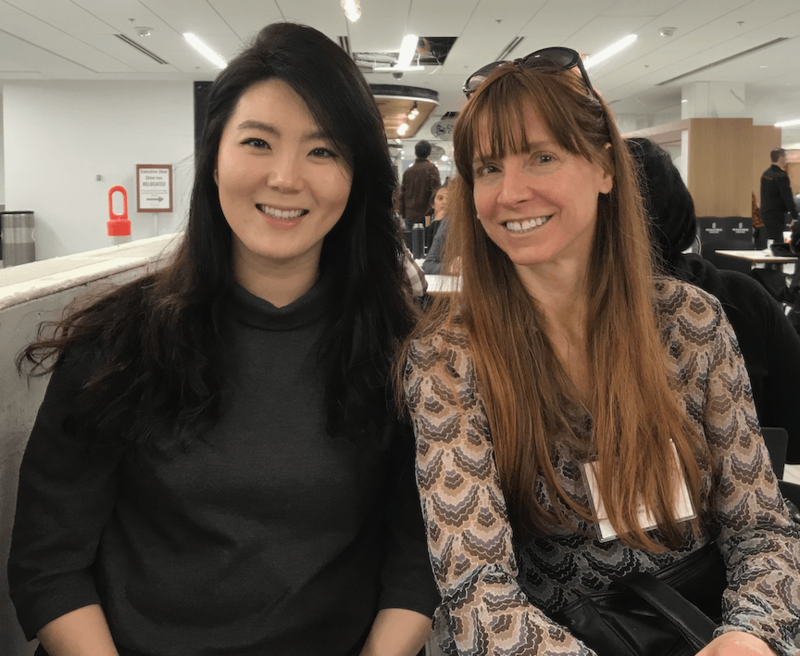 Two of my doctoral advisees have been awarded travel grants from the Department of Teaching & Learning and the Education & Human Ecology Office of Research. 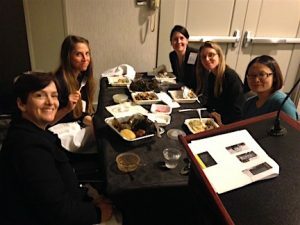 Somin Kim (pictured here at AAAL) will present with me at the 2019 meeting of the American Association for Applied Linguistics (AAAL) on our Cross-College Seed Grant- funded project (with Dr. Monique Mills and Bethany Frick) ‘Assessing Black Students’ Narrative Language: Emic and Etic Perceptions’. Jackie Ridley will present ‘Making (And Not Making) Connections with a “Mirror Text”: Intertextuality with Refugee and Immigrant Youth’ at the 2019 American Educational Research Association (AERA) Conference. Congratulations on receiving two grants for your travel! In the Language Pod we have a tradition of celebrating our students who are graduating and moving on to exciting new endeavors. 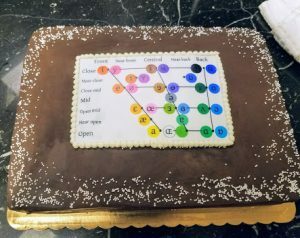 Cake is central to that tradition. Congratulations to Hannah and Taylor, 2 of my fabulous 5700 students from Spring 2017 who went to to work as Research Assistants in the Pod and who head next to graduate work in Speech and Hearing Sciences! On Monday, February 26th I will participate in ‘Careers in Linguistics: A Panel Discussion’. This event is an informal discussion with people who have careers related to Linguistics. I will be joined by Dr. Tim Micek, who directs the MATESOL program at Ohio Dominican University; Gail Messico, who currently serves as the Peace Corps recruiter at OSU and in the Columbus area; and Joe Marulli, who works as a cryptologic linguist providing translation and analysis in support of national defense. The panel will be held in Arps Hall 243, 3–4:30pm. OSU is hosting the 2017 Second Language Research Forum! AISLab will present on Friday at 4 pm in Hagerty Hall 062. 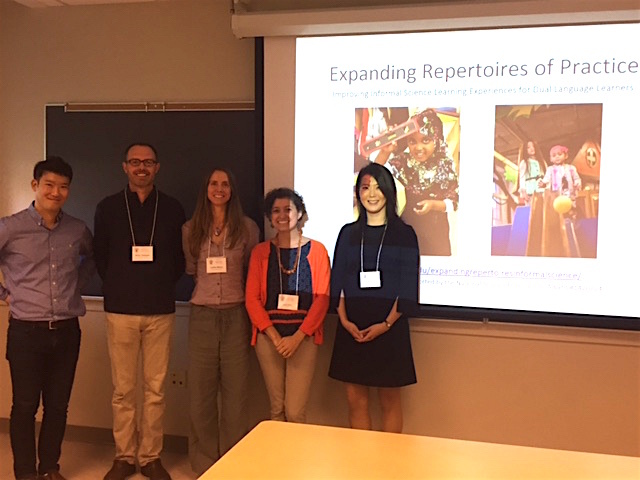 Our paper ‘Engaged second language research: Supporting dual language learners science and language learning’ describes the Expanding Repertoires project and presents some preliminary findings from the Exploratory Study. Sunday morning I will serve as moderator for the panel discussion by the plenary speakers Patricia Duff, Brian MacWhinney, Kara Morgan-Short, and Lourdes Ortega. SLRF attendees are then invited to visit COSI and the Language Pod from 11 to 2 pm. Photo: Minseok Choi, Brian Seilstad, Leslie, Jackie Ridley, Somin Kim (current AISLab minus undergrad research assistants Andrea and Anisa). The new Buckeye Language Network website went live this summer. I have the honor of being the first faculty member to be in the BLN Spotlight. The new documentary ‘Talking Black in America‘ is coming to Columbus on Tuesday, June 6th. The screening will be at COSI in the Galaxy Theater. Executive producer Walt Wolfram will do a Q&A, in conversation with OSU professors, Dr. Elaine Richardson and Dr. Monique Mills. This event is sponsored by the Buckeye Language Network, the Department of Linguistics, the Department of Psychology, and COSI. Check out the trailer. OSU has committed to offering Spanish and Mandarin interpretation at Commencement as a “pilot” this spring. They continue to seek qualified interpreters for Somali, Arabic, and Brazilian Portuguese. Check out the story on WOSU Radio, ‘After A Push From Students, Ohio State Will Offer Commencement Translations‘.